Last June I made a decision. I was going to go through yoga teacher training. It was a tough decision, but once it made it, it just felt right. The RYT-200 training began in August. The 12 of us in the training group laid out our mats like it was the first day of school. Eager. Excited. Nervous. We talked about why we were there. What we hoped to get out of it and what yoga does for us personally. We all had our own reasons, our own experiences, our own styles and our own goals. Since that first day, we’ve all had our own journeys. All very different. And we’ve all dealt with life in our own ways. Through it all, we’ve all had one common bond, the love of yoga and this journey towards becoming a registered yoga teacher. Some have already taken what they learned and started teaching. Others are just happy to have made it this far and still ask themselves what next. Some are closer to teaching than they thought they’d be. Others, furher from it. Personally, I’m somewhere in the middle. Going through teacher training has been an amazing experience. Part of me thinks it has helped me deal with difficult times more easily. Part of me thinks I have become so much more aware of who I am that hard times have been a different flavor of hard because ignorance and denial are now just a shade of what they used to be. It’s incredibly initimidating. Who am I to try to ‘teach’ something so powerful and with such an incredible history? The way I see it, with yoga, the teacher is there as a guide, as a helper, as another person who is passionate about the power of the practice and is there to encourage through words, through guidance and as a representative of all that we hold sacred about yoga. Teacher training has helped me to understand what yoga can do for me. There is a long way to go on this journey, and I have a feeling some day, down the road, I will use it to help others. But, in the time being, it is certainly helping me learn about myself and how to find calm and serenity in the crazy world we live in, and that, my friends, is priceless. As Patanaji says in Sutra 1.14 Sa Tu Dirgha Kala Nairantarya Satka-Rasevito Drdhabhumih – practice becomes firmly grounded when well attended to for a long time, without break, and in all earnestness. That’s exactly what I intend to do. For myself and for how I can take it into the world and share it with other. Ok, lame headline. I know. But I just can’t help myself sometimes. I’m studying the chakras for my teacher training final tomorrow and I really am fascinated by them. I’d love to learn even more about them. I tried a class one time that was intended to really focus on the chakras. Unfortunately while it kept me very intrigued about the possiblity of how doing specific postures to work certain chakras can help keep your body in balance, all this particular class did was have me questioning – and by questioning I mean not really getting into – Kundalini yoga. **sidebar** if you do Kundalini and it’s a style you love, I would really like to understand more about it and the benefits that are unique to it, so, please…. comment below and let me know! When you’re stressed and tight in certain areas, the energy can’t flow and the light is dimmed. Certain yoga postures can help re-open the flow. It sounds very akin to acupuncture, just without the needles. Starting at the bottom: The Muladhara Chakra, or root. It’s red and is all about being grounded, starting with exercises to open the bottom of the feet so they can ‘root’ into earth and moving up the legs. Uttanasana is a great way to root the feet into the ground while lengthening the hamstrings to help calm the tension being held in the legs like you’re prepared to run. Next up is the Swadhistana chakra at the lower back/hips, something I know all too well! It’s orange in color and and is associated with sexuality and emotions. Hello. This one hits home way too much for me. When this chakra is in balance, you just go with the flow. Clearly mine is not in balance most of the time. A few asanas to get it back in balance are gomukhasana (cow face), pigeon pose, and baddhaa konasana. Then there’s the Manipura chakra at the navel. It’s the fire chakra that glows yellow. Maniupura is associated with self-esteem and my other big one, digestion. When it’s balanced, you’re bold and can take sensible risks and live life. When it’s constricted, there can be digestive problems and low self esteem. The asanas that can help put this chakra back in balance include Virabhradasana A & B, Navasana to strengthen the abdomen and even surya namaskara. Moving up the body, the next chakra is anahata at the heart. It’s color is green and it’s the balancing point. An anahata chakra out of balance is likely to bring on feelings of loneliness. Too much brings on feelings of jealousy. Backbends or merely laying over a bolster to open the heart can help the energy flow through this fourth chakra. Number five is Vissudha, the throat chakra that emits energy the color of a blue sky or turqoise. A vissudha chakra that’s unbalanced will result in either fear of speaking or over talkativeness. It can also cause shoulder tension, teeth grinding or other communication problems. Sarvangasana is a good way to get this chakra back in balance. Next up. At spot number 6, Ajna Chakra, also known as the third eye. The command center’s aura is indigo. The third eye sees beyond the physical and when it’s overly active, we have too much energy that can bring about headaches and trouble concentrating. When it’s deficient, it can cause eye problems and poor memory. One way that I personally have worked the sixth chakra is to sit in child’s pose and feel the pressure of the ground against the third eye. And finally, at the top, Sahasra Chakra, the crown. When it’s in balance, the world is limitless. It’s represented by a thousand-petaled lotus. Excessiveness of this chakra comes across as being overly intellectual. When it’s deficient, you have trouble thinking for yourself. Meditation is the best way to bring this chakra into balance. There are days when I wake up and it feels as if every chakra is blocked and there is no energy moving throughout my body. But, as I usually find, a yoga practice is able to awaken the energy and the light from within so I feel as if I glow with all the colors of the rainbow and I am, I feel, I do, I love, I speak, I see and I understand. Yes, I did it. I used the ultimate cheesy phrase when talking about guacamole. But when it comes to avocadoes, I just can’t help myself! Up until yesterday, I thought the best guacamole on the planet was from Mexx in Chicago. Now I know, the best guacamole I’ve ever had can be found at Besa Grill in Clearwater. I stumbled upon it thanks to Groupon, but didn’t really think much of it til I looked at the menu online and discovered they have 5 kinds of guacamole! 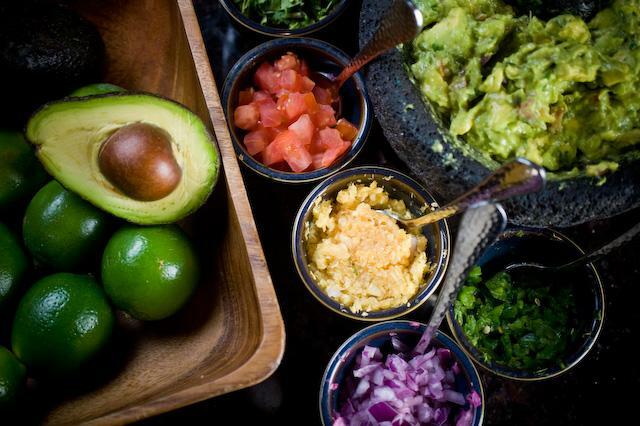 FIVE TYPES OF GUACAMOLE. AND, they prepare it tableside. How awesome is that!?!?! Thankfully, the reporter jumped on the guacamole bandwagon and when a different story fell through, she ended up there in a hurry. Even better, they were kind enough to send her home with a massive pile of guacamole and chips which I proceeded to hoard all to myself. One bite, and I was in heaven. Turns out, the secret is the mortar and pestle. The chef says it releases the oils just the right way. Of course it does. Doesn’t everyone know that? And have a mortar and pestle made out of Mexican lava at home? Good news, if you don’t have one, the chef says you can use a metal bowl and a heavy spoon to get the same effect. 1. Create a paste using jalapenos, red onion, cilantro and garlic. I don’t normally like jalapeno but something they did made it so I don’t even taste the jalapeno. 3. Add those in to make it creamy. 4. Add some chopped fresh tomatoes and lime juice. 5. Another pinch of salt, a light mixing, and you’re done! I’ll admit, I haven’t tried this myself yet. After all, I got four avocadoes worth from them, but I’m super excited to break my mortar and pestle in for Cinco de Mayo in a few weeks. And, if that doesn’t work, I will certainly be back to Besa! BTW – if you like to change things up, their other options include goat and blue cheese, mango, roasted corn and black bean, and bacon. Yummy goodness … and even better with a Margarita! Salud! This was my ‘studio’ today. It was beautiful. It was peaceful. And it took grounding to a whole new level! Grounding myself and my feet is not one of my strengths. Let me start with that. It’s gotten better. And, while I’m slightly afraid to admit it, I think wearing Vibram Five Fingers has actually helped strengthen my feet and improve my standing balance postures. Still, I struggle. And, today, with the wind blowing, balancing took on a whole new challenge. 1. Being present. The more my mind wandered, the more unsteady I felt. Funny how that whole concept is so much bigger than just the benefits it has in a yoga practice. Being present steadies not just a balance posture, it steadies your mind. Think about it. When your mind is scattered, everything about your life feels off balance. It’s impossible to feel steady in life, if your mind is scattered. As we know from yoga, going back to the breath, really deep thoughtful breaths, can help calm the mind, bring you back to the moment, calm the racing mind, and bring you back into balance. As my favorite author/interviewee Paul Pearsall (may he rest in peace floating on a rainbow) said, “I’m not saying work less. I’m saying, when you’re at work, be at work. When you’re home. Be at home. We are unproductive at work because we want to be home. We are ineffective at home, because we’re thinking about work. Just be where you are. The work will be there when the rainbow’s gone, but the rainbow won’t wait for you to finish your work. 2. Reach for the sky with the crown of your head. Lengthen the spine and open that seventh chakra toward the heavens while focusing on the four corners of the foot being grounded. It helps keep you from collapsing into your hip. This also has more wide ranging benefits. Standing tall, lengthening the spine allows the energy to flow freely through the body and opens up everything. I know I, personally, tend to collapse into my hips when I’m just standing somewhere. I’ve witnessed plenty of friends to who tend to sit hunched over. Both of the these postures keep energy from flowing freely, which impacts our entire way of being. Keep in mind, the feet are also part of the mulandara chakra and part of what needs to be balanced for optimal physical and mental health. 3. Open the feet. We are not nice to our feet. Especially women. We keep them cooped up in shoes that bind and squeeze and just plain hurt! Yesterday, though, I decided to open up my feet. I started with a tennis ball and then moved on to the foot massager I got from my chiropractor. I relentlessly worked the fascia on the bottom of my foot to help open it. It hurt like hell… but it worked! (and a potential side benefit that may be connected and may just be coincidental. According to a reflexology chart, a spot near the arch of the foot corresponds to the stomach. My stomach has been bad lately and yesterday, after working that spot on my foot, I ate and my stomach was significantly better! All I’m saying is, it can’t hurt to keep trying that approach! 4. Finally, another beautiful thing about Ashtanga is the idea that each pose builds on a previous posture. We start with tadasana and return to tadasana often throughout the series. Rather than just standing at the top of your mat without any attention, make tadasana an ‘active’ posture, starting with the feet. Engage the four corners of the feet as you stand there. Engage the legs. Draw shoulders down the back. Engage the bandhas. Then, when it comes time to uttitha hasta padmotanasana, your legs will be ready for it. Remember, build from the ground up. You don’t build a house starting with the roof. You start with the foundation. In this case, your feet are the foundation. Without a solid foundation, the rest of your temple will be off balance and even the slightest breeze will blow you over. I admit it. I’m an ashtanga snob. I love Ashtanga and no other style really matches up. Once in a while I’ll do yin or hatha, or even anusara online, but nothing really measures up on a consistent basis. Ever since the first time I walked into White Orchid Yoga and and took my first class with Ally Ford teaching the primary series, I’ve been hooked. No other style of yoga makes me feel quite the way Ashtanga does. If you’ve never tried Ashtanga, you might wonder what it is that makes it so unique. Allow me to get on my ashtanga soapbox for a moment. I find that so powerful. It’s not just about getting a ‘workout’. It’s about eventually being so pure in one’s way of being that they become one with the universe. And then there are the postures that make up the series, each with its benefits as described in Yoga Mala, each building on a previous posture to help cleanse and detoxify the body to prevent disease (or dis-ease as is really the case). Some work the organs, some burn fat, and some, well, let’s just say some make it easier to remove waste from the body and help the organs involved in those function. The other beauty of Ashtanga is the consistency of it – well, sort of. 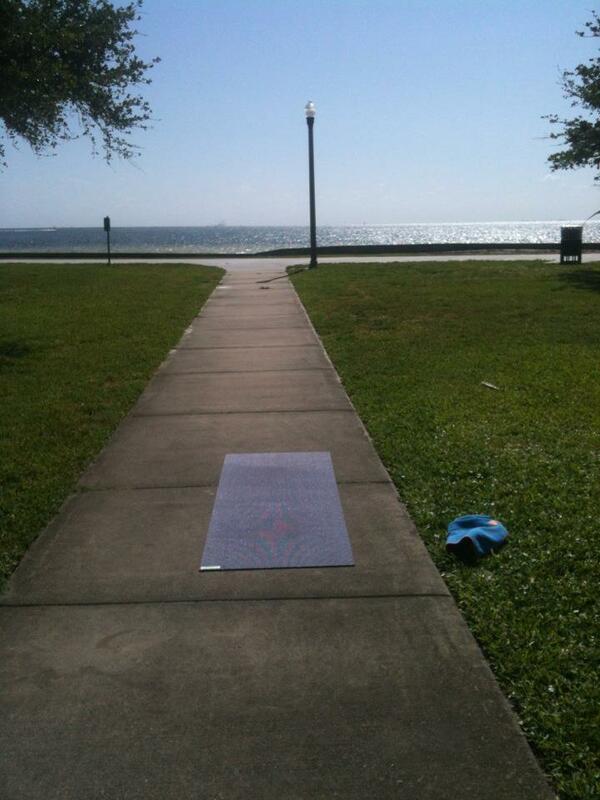 No matter where you are, an ashtanga practice is relatively universal. There is the opening chant that is so beautiful and sets the stage for the practice. Then there is the sequence which, assuming it’s a traditional practice, is going to be the same postures, in the same order, all done the same way (I’ll get back to why I love this so much in a moment) and then, like most other yoga practices, there’s savasana to seal it all in. But, again, Ashtanga, unlike other styles where the teacher generally shares his/her thoughts or reads from the writings of another yogi, ends with a closing chant. The vibrations of the sounds are felt deep within the practitioner and unite the energies in the room like nothing I’ve ever experienced before. Yoga is intended to be a moving meditation, and ashtanga’s consistent sequence allows that to happen in a unique way. Unlike typical “flow” classes where the students are waiting with baited breath to find out what position the teacher is going to instruct them to move into next, which makes focusing on each pose slightly more challenging, at least for me, with ashtanga, the sequence becomes habit. You know where you’re moving next, allowing you to really focus on each posture and get deeper into it. Earlier I made a comment where I said the practice is the same each time “sort of”. Let me take a moment to expound on the ‘sort of’. I am far from the first to say this, but I can certainly attest to it, that each time you step on the mat, the practice is different. There are days where an attempt at a balancing posture feels more like trying to stand on a surf board in rough water, and there are times when those same balance postures are completely solid. There are days when you fold forward into padahastasana and your hands plant firmly on the ground, and other days when it feels like every fiber of your hamstring is resistant to being stretched. But with all that said, there is one statement I can make that holds true from one practice to the next, everytime I step off the mat after doing an asthanga practice, I feel better than when I started, and I can’t say that about other styles of yoga.